Olive oil --- 1 Tbsp. Ground cumin --- 1/4 tsp. TABASCO® brand Dry Red Flavoring --- 2 Tbsp. Olive oil --- 3 Tbsp. Garlic, minced --- 1 tsp. Kale, cleaned and chopped --- 2 qt. Baby romaine lettuce hearts --- 1 qt. Red leaf lettuce --- 1 qt. In a bowl, combine Quinoa Salad ingredients; mix and set aside. In a small pot, bring simple syrup to a boil. Add almonds and cook until syrup is almost evaporated; add TABASCO® Chipotle Sauce. In a small bowl, mix together TABASCO® Dry Red Flavoring, curry powder and cinnamon; strain almonds and coat with this spice mixture. Lay almonds on a sheet pan lined with parchment paper and allow to cool. In a small bowl, place butternut squash. Mix olive oil in and sprinkle cinnamon on; spread squash dice on a sheet pan lined with parchment paper and place in the oven until cooked, about 8 to 12 minutes. In a sauté pan over medium-high heat, add olive oil and garlic; cook garlic until lightly browned. Add kale and cook for 1 to 2 minutes, until kale is soft and bright green; remove from heat. Place cooked Kale on a plate. Arrange carrot shavings, red leaf lettuce and romaine hearts around the Kale. 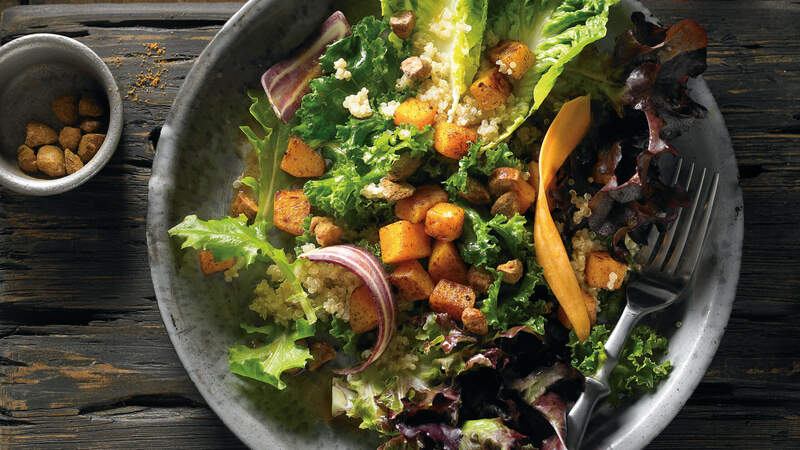 Sprinkle Quinoa Salad atop the greens and place roasted Butternut Squash on top. Garnish with Chipotle Candied Almonds and serve.